CP-Carrillo has a new race version piston for the 2009-2019 Yamaha YFZ450R ATV. This new piston features 14.0:1 compression ratio, profiled pin bore machining, a newly engineered and extensively tested tapered wall DLC coated wrist pin made from 9310 steel, CT-3 skirt coating and our tried and true CP9500 ring pack. The CP9500 ring pack features a .8mm carbon steel gas nitride top ring with a 2mm oil ring setup. The piston is designed with a new cam and barrel profile, is intended for standard 95mm bore and weighs 10 grams less than the non-race version. It is designed to be used with our +3.5mm long rod which features a 1mm smaller wrist pin. This piston is engineered and manufactured for the rider that must have maximum performance and reliability in their race machine. 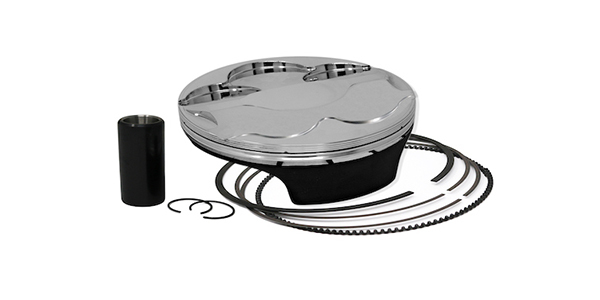 The piston kit comes complete with piston, pin, locks and rings; the part number for this new piston is MX1P27-P.
CP-Carrillo offers a wide variety of high performance piston kits and connecting rods for the powersports segment. New additions to our line up give the customer more choices than ever to choose from for premium quality pistons and rods. With the assistance of high level race team and engine builders, all of our kits have been developed using proven technology to ensure maximum power and durability. As a company, quality is always one of our top concerns, and we continue to move forward by continually setting the bar higher while pushing ourselves to the next level. By doing this you can rest assured that every piston and rod that leaves our company is of the highest standard and of the latest technology.